Irving, Texas – January 30, 2009 — Four Js Development Tools is pleased to announce the opening of the Genero Report Writer v1.00.02 BETA Early Access Program (EAP) today January 30, 2009. See the “How to subscribe” section. Genero Report Writer makes it easier to write and maintain large numbers of business reports within your organization, with no limitation on the number of pages you can print. It clearly separates the activities of gathering the data and graphically designing the report. You can change the graphical presentation of the reports independently; eventually you can allow third parties to make changes, with access restricted to graphical changes. The graphical representation of your report is created using Genero Report Designer. You can write quick and simple reports by positioning elements in your report, or use the layouting feature to write a single report that adapts to multiple page formats and multiple languages without data truncation. Specific components – page headers/footers, group headers/footers, barcodes, graphs and charts, … – are available for business reporting. Genero Report Engine uses a data streaming technology to reduce memory usage to the minimum, and provides the capability to print large reports with minimal lead-time before the display of the first page*. 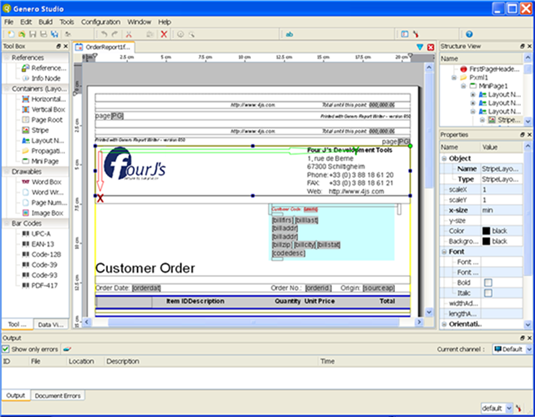 It uses the open standards XML, SVG, and PDF for report definitions and viewing. * Full data streaming is available when you use the Genero Report Viewer (Not available for PDF format). The Genero Report Viewer (GRV) is now part of the Genero Desktop Client package. Genero Report Writer is currently “Beta” software made available through an Early Access Program (EAP). This software is provided for testing purposes and should by no means be installed on a production machine. The features shown in this product are not in their final state and will change by the time of the release; in particular, reports that are designed might not be compatible with the final version of the software. The participants of the EAP program agree to give feedback on the software by the end of the Beta program by answering the survey that will be provided. If you have not yet subscribed to the Beta program you can still request this; you must have a Four Js web site account (“My Account”) that enables access to privileged technical information. * Four Js will send an acknowledgment of your subscription within 24 hours (Monday -> Friday).